Background: Brimonidine tartrate is a highly selective alpha 2 agonist that induces direct vasoconstriction of small arteries and veins, thereby reducing vasodilation and edema. Objective: To review the current literature regarding the safety, efficacy, and patient acceptability of brimonidine 0.33% gel. Methods: A PubMed search was performed using the terms brimonidine 0.33% gel, rosacea, safety, efficacy, and acceptability. Peer-reviewed clinical trials and case reports from 2012 to 2016 were screened for inclusion of safety, efficacy, and/or patient acceptability data. Results: Brimonidine topical gel 0.33% is associated with mild, transient skin-related adverse reactions. Efficacy may be achieved within 30 minutes of administration with maximal reductions in erythema 3–6 hours after administration. Patient satisfaction with use of brimonidine topical gel is superior to vehicle gel for facial appearance, treatment effect, facial redness, and daily control of facial redness. Limitations: Studies were typically limited to 1-year follow-up. Only one study has examined the use of brimonidine topical gel in combination with other rosacea and acne medications. Discussion: Brimonidine topical gel 0.33% is a safe, effective, and patient-accepted treatment for facial erythema of rosacea. Treatment options for rosacea include topicals such as metronidazole, azelaic acid, ivermectin, brimonidine, oxymetazoline, and sulfacetamides. For PPR, oral metronidazole, doxycycline, or isotretinoin may be employed. Brimonidine and oxymetazoline are approved by the Food and Drug Administration (FDA) for the treatment of the facial erythema associated with rosacea. Brimonidine is a highly selective alpha 2 agonist that binds alpha 2 receptors on the vasculature inducing direct vasoconstriction of both small arteries and veins, thereby reducing vasodilation and edema.21 We aim to summarize the safety, efficacy, and patient acceptability of brimonidine topical gel in the treatment of facial erythema associated with rosacea. A PubMed search was performed using the terms brimonidine 0.33% gel, brimonidine and rosacea, brimonidine 0.33% gel and safety, brimonidine safety and rosacea, brimonidine 0.33% gel and efficacy, brimonidine efficacy and rosacea, and brimonidine acceptability and rosacea. Ten peer-reviewed clinical trials and case reports from 2012 to 2016 were screened for inclusion of safety, efficacy, and/or patient acceptability of brimonidine topical gel. Full text was reviewed; all 10 articles were included as they contained pertinent research data or clinical reports. Review articles were excluded. 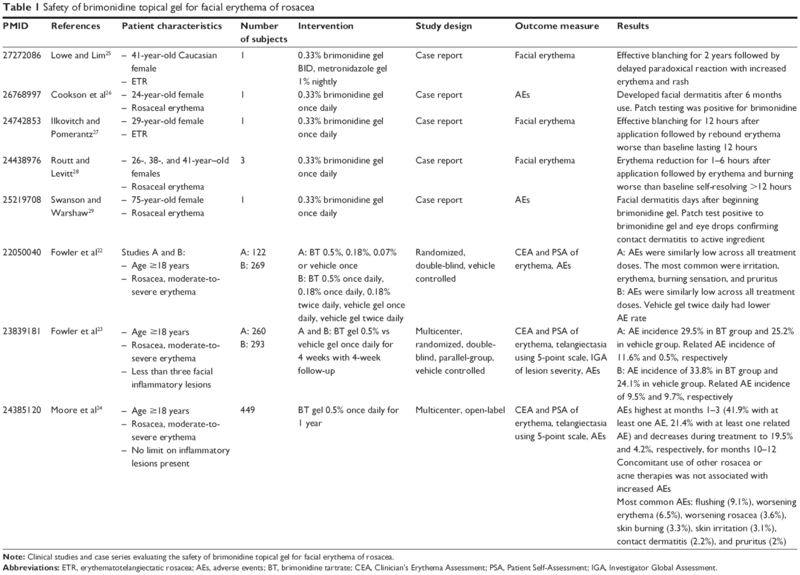 Note: Clinical studies and case series evaluating the safety of brimonidine topical gel for facial erythema of rosacea. Abbreviations: ETR, erythematotelangiectatic rosacea; AEs, adverse events; BT, brimonidine tartrate; CEA, Clinician’s Erythema Assessment; PSA, Patient Self-Assessment; IGA, Investigator Global Assessment. Note: Clinical studies and case series evaluating the efficacy of brimonidine topical gel for facial erythema of rosacea. Abbreviations: BT, brimonidine tartrate; CEA, Clinician’s Erythema Assessment; PSA, Patient Self-Assessment; IGA, Investigator Global Assessment. Note: Clinical studies and case series evaluating the patient acceptability of brimonidine topical gel for facial erythema of rosacea. The safety of brimonidine topical gel 0.33% once-daily dosing is well characterized. Although there is a relatively high rate of adverse reactions, up to 41.9% with daily use, the reactions are generally mild, transient, and limited to the skin.24 The most common reactions are flushing, erythema worse (or at least perceived as worse) than baseline, worsening of rosacea, irritation, and pruritus.22–24 These side effects generally present shortly after application or as the effects of the medication are wearing off and resolve within hours without intervention. Side-effect incidence is typically highest from initial use through month 3 of use but decreases with longer duration of daily application. Early studies reported low incidence of contact dermatitis and rebound erythema with topical brimonidine tartrate, but recent case studies suggest that these are potentially significant reactions. Contact dermatitis to either vehicle ingredients or brimonidine occurred in multiple patients.24,26,29 Exaggerated rebound erythema ~12 hours after application of brimonidine topical gel has also been reported. The erythema may be worse than baseline but typically resolves within 6–12 hours.25,27,28 These adverse events should be considered when developing treatment regimens. However, given the mild and transient nature of these adverse reactions, a trial of brimonidine topical gel after side-effect counseling may be reasonable. Rosacea treatment presents a unique challenge. Brimonidine topical gel 0.33% is a novel treatment agent for persistent erythema of rosacea. Though monotherapy may be beneficial in patients with ETR, combination therapy with other rosacea and acne medications may be necessary in patients with features of both ETR and PPR. The short-term and long-term erythema control offered by brimonidine tartrate gel has its advantages. Patients seeking short-term erythema control for specific events may benefit from as-needed use, whereas those seeking long-term erythema control may opt for daily use resulting in reduced baseline erythema. Controlling erythema in rosacea is a difficult task, but brimonidine topical gel 0.33% has proven to be a useful addition to the current treatment arsenal. Dr Steven R Feldman has received research, speaking, and/or consulting support from a variety of companies, including Galderma, GSK/Stiefel, Almirall, Leo Pharma, Baxter, Boeringer Ingelheim, Mylan, Celgene, Pfizer, Valeant, Taro, Abbvie, Cosmederm, Anacor, Astellas, Janssen, Lilly, Merck, Merz, Novartis, Regeneron, Novan, Parion, Qurient, National Biological Corporation, Caremark, Advance Medical, Sun Pharma, Suncare Research, Informa, UpToDate, and National Psoriasis Foundation. He also consults for others through Guidepoint Global, Gerson Lehrman, and other consulting organizations. He is the founder and majority owner of DrScore. He is the founder and part owner of Causa Research, a company dedicated to enhancing patients’ adherence to treatment. The authors report no other conflicts of interest in this work. Tan J, Blume-Peytavi U, Ortonne JP, et al. An observational cross-sectional survey of rosacea: clinical associations and progression between subtypes. Br J Dermatol. 2013;169(3):555–562. Webster GF. Rosacea. Med Clin North Am. 2009;93(6):1183–1194. Powell FC. Clinical practice. Rosacea. N Engl J Med. 2005;352(8):793–803. van Zuuren EJ, Kramer S, Carter B, Graber MA, Fedorowicz Z. Interventions for rosacea. Cochrane Database Syst Rev. 2011;(3):CD003262. doi:10.1002/14651858.CD003262.pub4. Abram K, Silm H, Maaroos H-I, Oona M. Risk factors associated with rosacea. J Eur Acad Dermatol Venereol. 2010;24(5):565–571. McAleer MA, Fitzpatrick P, Powell FC. Papulopustular rosacea: prevalence and relationship to photodamage. J Am Acad Dermatol. 2010;63(1):33–39. Jackson JM, Knuckles M, Minni JP, Johnson SM, Belasco KT. The role of brimonidine tartrate gel in the treatment of rosacea. Clin Cosmet Investig Dermatol. 2015;8:529–538. Yamasaki K, Gallo RL. The molecular pathology of rosacea. J Dermatol Sci. 2009;55(2):77–81. Yamasaki K, Di Nardo A, Bardan A, et al. Increased serine protease activity and cathelicidin promotes skin inflammation in rosacea. Nat Med. 2007;13(8):975–980. Lacey N, Delaney S, Kavanagh K, Powell FC. Mite-related bacterial antigens stimulate inflammatory cells in rosacea. Br J Dermatol. 2007;157(3):474–481. Brauchle M, Funk JO, Kind P, Werner S. Ultraviolet B and H2O2 are potent inducers of vascular endothelial growth factor expression in cultured keratinocytes. J Biol Chem. 1996;271(36):21793–21797. Bielenberg DR, Bucana CD, Sanchez R, Donawho CK, Kripke ML, Fidler IJ. Molecular regulation of UVB-induced cutaneous angiogenesis. J Invest Dermatol. 1998;111(5):864–872. Longuet-Perret I, Schmitt D, Viac J. Tumour necrosis factor-alpha is involved in the contrasting effects of ultraviolet B and ultraviolet A1 radiation on the release by normal human keratinocytes of vascular permeability factor. Br J Dermatol. 1998;138(2):221–224. Sulk M, Seeliger S, Aubert J, et al. Distribution and expression of non-neuronal transient receptor potential (TRPV) ion channels in rosacea. J Invest Dermatol. 2012;132(4):1253–1262. Cribier B. Rosacea under the microscope: characteristic histological findings. J Eur Acad Dermatol Venereol. 2013;27(11):1336–1343. Steinhoff M, Buddenkotte J, Aubert J, et al. Clinical, cellular, and molecular aspects in the pathophysiology of rosacea. J Investig Dermatol Symp Proc. 2011;15(1):2–11. Aubdool AA, Brain SD. Neurovascular aspects of skin neurogenic inflammation. J Investig Dermatol Symp Proc. 2011;15(1):33–39. Del Rosso JQ. Advances in understanding and managing rosacea. Part 1: connecting the dots between pathophysiological mechanisms and common clinical features of rosacea with emphasis on vascular changes and facial erythema. J Clin Aesthet Dermatol. 2012;5(3):16–25. emc [webpage on the Internet]. Mirvaso 3 mg/g Gel – summary of product characteristics (SPC) – (eMC). Available from: http://www.medicines.org.uk/emc/medicine/28682/SPC/Mirvaso+3 mg+g+Gel/#PHARMACOLOGICAL_PROPS. Accessed January 29, 2017. Fowler J, Jarratt M, Moore A, et al. Once-daily topical brimonidine tartrate gel 0.5% is a novel treatment for moderate to severe facial erythema of rosacea: results of two multicentre, randomized and vehicle-controlled studies. Br J Dermatol. 2012;166(3):633–641. Fowler JJ, Jackson M, Moore A, et al. Efficacy and safety of once-daily topical brimonidine tartrate gel 0.5% for the treatment of moderate to severe facial erythema of rosacea: results of two randomized, double-blind, and vehicle-controlled pivotal studies. J Drugs Dermatol. 2013;12(6):650–656. Moore A, Kempers S, Murakawa G, et al. Long-term safety and efficacy of once-daily topical brimonidine tartrate gel 0.5% for the treatment of moderate to severe facial erythema of rosacea: results of a 1-year open-label study. J Drugs Dermatol. 2014;13(1):56–61. Lowe E, Lim S. Paradoxical erythema reaction of long-term topical brimonidine gel for the treatment of facial erythema of rosacea. J Drugs Dermatol. 2016;15(6):763–765. Cookson H, McFadden J, White J, White IR. Allergic contact dermatitis caused by Mirvaso(R), brimonidine tartrate gel 0.33%, a new topical treatment for rosaceal erythema. Contact Dermatitis. 2015;73(6):366–367. Ilkovitch D, Pomerantz RG. Brimonidine effective but may lead to significant rebound erythema. J Am Acad Dermatol. 2014;70(5):e109–e110. Routt ET, Levitt JO. Rebound erythema and burning sensation from a new topical brimonidine tartrate gel 0.33%. J Am Acad Dermatol. 2014;70(2):e37–e38. Swanson LA, Warshaw EM. Allergic contact dermatitis to topical brimonidine tartrate gel 0.33% for treatment of rosacea. J Am Acad Dermatol. 2014;71(4):832–833. Jackson JM, Fowler J, Moore A, et al. Improvement in facial erythema within 30 minutes of initial application of brimonidine tartrate in patients with rosacea. J Drugs Dermatol. 2014;13(6):699–704. Layton AM, Schaller M, Homey B, et al. Brimonidine gel 0.33% rapidly improves patient-reported outcomes by controlling facial erythema of rosacea: a randomized, double-blind, vehicle-controlled study. J Eur Acad Dermatol Venereol. 2015;29(12):2405–2410.